Thanks to the energy turnaround, increasing interest is being taken in geothermics as a regenerative energy source. The principle is that geothermal energy, for example in the form of thermal water, is used either directly for heating purposes or to generate electricity. Already before a geothermal power station is built, the local thermal water has to be examined, and its properties must be determined, since the efficiency and size of the plant significantly depend on the water’s heat content. In order to calculate this heat content, it is necessary to know the thermodynamic material properties of the thermal water - in particular, the specific, isobar heat capacity. A partly high salt and gas content of the water complicates the predictability of these variables. So far, it has only been possible to analyse samples in the laboratory. However, by taking samples on site and transporting them, the thermal water is depressurised and cooled down, which changes the water’s composition, and hence also its thermodynamic material properties. Scientists at the KIT have therefore developed a fluid calorimeter that can analyse thermal water of up to 170 degrees Celsius directly on site. 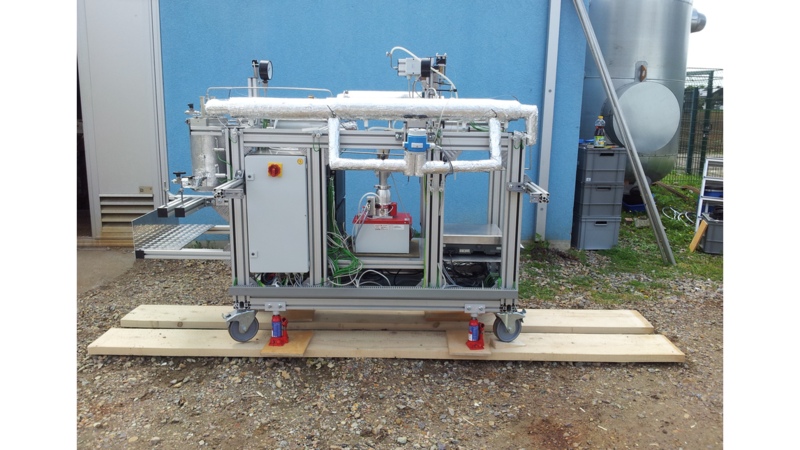 Thus the water can also readily be checked when the geothermal plant is in operation, with the calorimeter being used as a mobile test stand that is directly linked to the power station network via a “bypass”. The thermal water is immediately fed from the plant into the flow tube of the calorimeter. Here, it flows past temperature probes at the tube entry and outlet as well as past an Ohm heater. Given a certain fluid mass flow, the heat capacity can be determined using the amount of heat contributed by the heater and the difference in temperature between the two probes.